This baby blanket has a wonderful texture that both looks cute and feels great. This Petal Stitch Baby Blanket Free Crochet Pattern is perfect for any newborn girl. The beautiful crochet petal stitch with a classic and antic look, especially when done in this color combination. It is easy to make and doesn’t require a lot of time once you have mastered the fundamentals. It makes great baby shower gifts and can be used to decorate a nursery. Any baby would love to roll around on this plush blank. 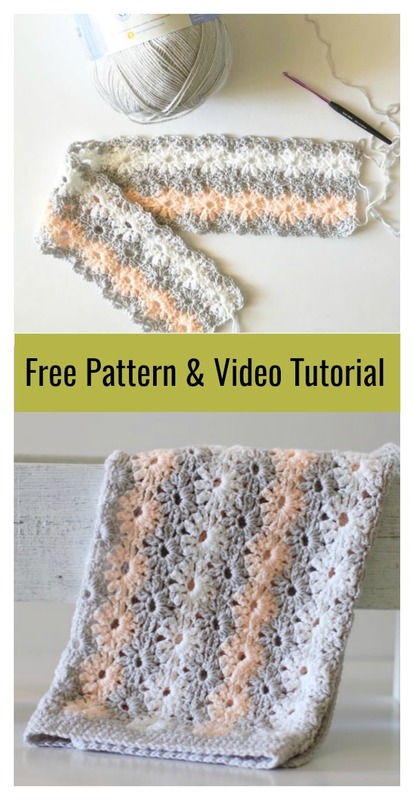 If you are new to crochet world, you can watch the video to how to crochet a baby blanket that is light, pretty and comforting to any new arrival. Thanks Daisy Farm Crafts for sharing this free pattern and video tutorial. The link for the free pattern is provided below photo. Happy crocheting. You might also like Stained Glass Ripple Baby Blanket Free Crochet Pattern.